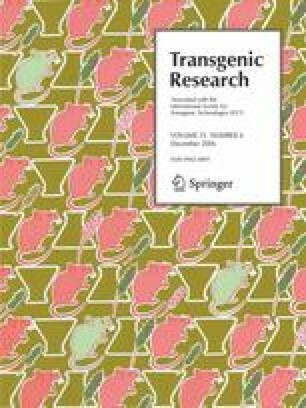 Currently, little information is available regarding the molecular organization of integrated transgenes in genetically-engineered fish. We performed a detailed structural analysis of an inserted transgene in one strain (M77) of transgenic coho salmon (Oncorhynchus kisutch) containing a salmon growth hormone gene construct (OnMTGH1). Microinjected DNA was found to have inserted into a single site in the coho salmon genome, and was organized with four complete internal copies and two partial terminal copies of the OnMTGH1 construct. All construct copies were organized in a direct-tandem (head-to-tail) repeat fashion in strain M77 and five additional strains (one also possessed a second recombinant junction fragment). For strain M77, the junctions between the transgene insert and the insertion point within the wild-type genome were cloned from strain-specific cosmid libraries and sequenced, revealing that the transgene insertion was accompanied by a deletion of 587 bp of wild-type DNA as well as a small insertion (19 bp) of unknown DNA upstream and a 14 bp direct-	tandem duplication of sequence downstream. Upstream and downstream wild-type DNA sequence contained several repetitive sequence elements based on Southern blot analysis and homology to repetitive sequences in GenBank. In the downstream flank, a pseudogene sequence was also identified which has high homology to the CA membrane protein gene from Schistosoma japonicum, a parasite closely related to Sanguinicola sp. parasites which infect salmonids. Whether the presence of an inserted transgene and the presence of potentially horizontally-transmitted DNA are indicative of a genomic region with a predisposition for insertion of foreign DNA requires further study. The information derived from this transgene structure provides information useful for comparison to other transgenic organisms and for determination of the mechanism of transgene integration in lower vertebrates. The authors gratefully acknowledge research support from the Canadian Regulatory System for Biotechnology.